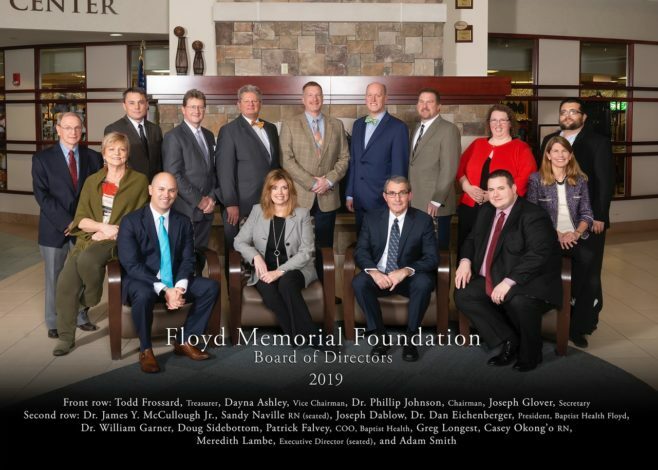 Founded in 1978, the Floyd Memorial Foundation is a tax-exempt organization established solely to support the mission and needs of Baptist Health Floyd and its affiliate organizations. The Foundation acts as a vital link between the hospital’s vision of excellence and its financial capacity to provide the best for the community it serves. Financial contributions from individuals, families, organizations and corporations help support advanced and effective resources in order to promote quality health and healing through sophisticated technology, community health screenings, medical and nursing scholarships as well as support for the Floyd County Family Health Center. Gifts from the community are essential to assist with support for projects that cannot be funded through Baptist Health Floyd’s general operating revenue. Your gift, whether great or small, will help us continue to fund the important programs, services and effective health screenings for our community as well as scholarships for future, qualified medical professionals. For a complete listing of opportunities visit our Giving Opportunities brochure.